Q. Why does OPU flush water mains? A. Flushing helps maintain water quality by removing mineral sediments from the water main lines that can affect water taste, clarity and/or color. It also helps identify malfunctions of the hydrants and related valves and helps determine weaknesses in the water distribution system. Q. Why does my water appear discolored? 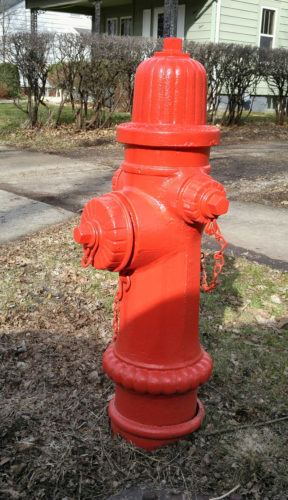 A. Discoloration is normal and will last only a short time after the nearby hydrants have been flushed. When a hydrant is opened, the water in the main line will flow out at a high velocity. This creates a scouring action in the pipe and dislodges fine sediment particles that have accumulated. The discoloration is due to the suspended particles mixing with water that have not had time to settle. There is no health hazard associated with the discolored water. Q. What should I do if my water appears discolored? A. The discolored water is safe for drinking, but you may choose to reschedule laundry or other work that may be affected by discoloration. Turn on the tap water to clear the pipes in your home by running all water faucets for a few minutes. Q. Is OPU wasting water when it flushes hydrants? A. Although it may appear to waste water, the process is part of a routine maintenance program necessary to maintain the integrity of the water system allowing us to continue to deliver the highest quality water possible to our customers. It is necessary to periodically flush water through the main lines in order to protect the quality of your drinking water. If you have questions about the water main flushing, please contact the Owatonna Public Utilities at 507-451-1616. With your help during this work, we will be able to upgrade and maintain our facilities. Thank you for your continued help in making Owatonna a wonderful place to live.